‘Come, ye, people to the Bonfire! The flames danced around the wood violently, hugging it fluidly as the wood began to crack and snap under its force. 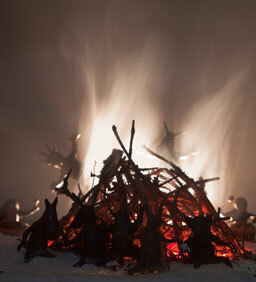 Around it, the Snow Drifters and many Luceria natives danced, chanting the call of the Great Winter Bonfire three times. The Snow Drifters were well known for their aloofness and mysterious nomadic behavior all throughout Luceria but above all, the people knew of their Great Winter Bonfire ceremony every December 31. The fire would burn and natives would celebrate the healthy year on the very last day to celebrate the sun approaching of the brand new year, beginning at sunset and carrying into sunrise. Every creature visiting the bonfire was full of joy. The Snow Drifters would spend the majority of the year exploring the mountainous regions of Luceria, collecting every bit of firewood they possibly could along the way for the bonfire at the end of the year. Anything the Drifters could find, they would gather for their bonfire and when the end of December finally came around, they traveled all the way to the eastern side of the Lucerian Fields for it. From that point on, they remained in Lucerian Fields until the very beginning of February as Spring would begin to approach and return to their mountains. And what a site the bonfire was! Creatures of all shapes, sizes, and origins visited from all throughout Luceria to celebrate the wonderful year and the introduction of another. Each would bring a present of some sort, typically an additional piece of wood for the fire or fireworks. Together, the collective people of Luceria would sing together the great ancient chants of the Great Winter Bonfire and drum along holiday songs to celebrate the season. The entire Lucian Fields were filled with boisterous laughter, happy people, and warmth. For Knite, the sight was absolutely breathtaking. He had heard dozens of stories of the Great Winter Bonfire ceremony, especially from Knitemire’s elder, but nothing could match the site before him. It felt like a hazy dream with people dancing around evenly , encircling the bonfire, singing with rosy cheeks until their entire faces turned blue. In the distance, fireworks were exploding above the crowd, contrasting the blackened sky. Dancing with the stars, they painted the sky with rich, vibrant colors. Every creature seemed absolutely happy to be alive, dispelling every negative thought of the Snow Drifters, any worries of their year, anything troublesome to think about. Knite added his collection of twigs to the stock of firewood and approached the dancing circle around the fire nervously. Hastily, someone snatched his hand and jerked him right into the circle, forcing him to dance along. Mora gave him a twisted smile and continued singing along. With all of Knite’s might, he mustered up the loudest voice he could and joined in with the ancient chant for the first of many times to come. To learn more about Knite and The Ghost Lights you can check our previous coverage, as well as the games’ official Kickstarter page. Be sure to check back in regularly for more trips to Mistland. Knite and The Ghost Lights is a stop motion adventure game from Mobot Studios that is currently in production. No word on a release date yet. DISCLAIMER: This is inspired by the Mistland Wiki Page and includes quotations from it. Cliqist does not claim these quotes as its own original work but incorporates them to enhance the story.